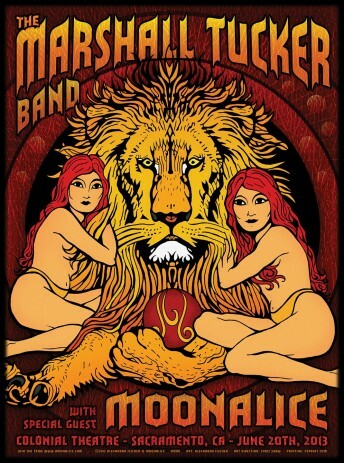 According to Moonalice legend, tonight's poster by Alexandra Fischer depicts the mythical Lion King of our tribe, Caldwell Moonalice, along with his human partners, Marsha and Tucka. Caldwell dreamed of starting a toy factory, but he couldn't get it done. For one thing, he was mythical. Being a lion he also lacked money and opposable thumbs, both of which are really important in the toy business. So Caldwell, Marsha and Tucka moved to South Carolina and helped some nice people form a band. The nice people named the band after the two women in this poster. You can look it up. We want to thank Dog and the Marshall Tucker Band for another great show. Thank you!! !